I realize this time of year has got to be difficult for you. And I’m going to add to your misery with today’s pumpkin soap recipe… Sorry. I’m not into chasing the latest processed food fad laced with pumpkin “artificial flavoring”, but I AM a aficionado of the warm, comforting scents and flavors of cinnamon, nutmeg, and ginger. Especially when combined in homemade baked goods or alongside homegrown pumpkin puree. My blog is no stranger to pumpkin posts. 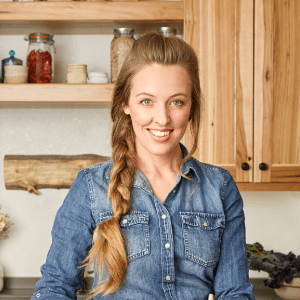 We’ve talked about how to make pumpkin puree the easy way, how to can pumpkin, how to make your own pumpkin pie spice, how to make honey maple pumpkin bread, and I’ve even shared my #1 favorite pumpkin pie recipe. 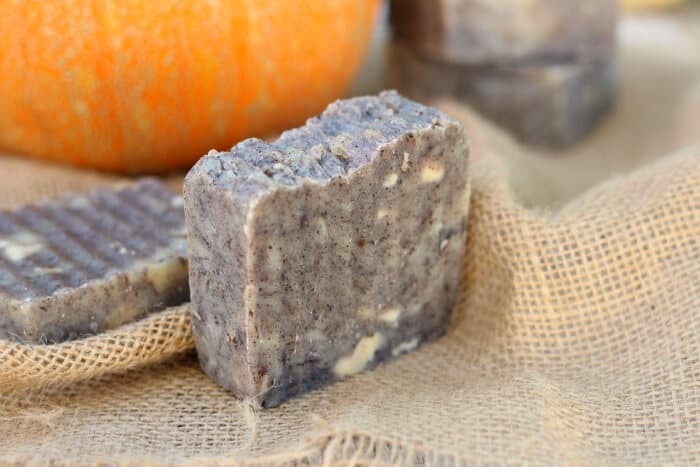 But today I’m venturing off the beaten path with this spicy, soothing homemade pumpkin soap recipe. Not only does it use real pumpkin, but it also calls for real spices, instead of artificial fragrance oils. I don’t claim to be a artisan soap maker by any means, and usually my soap recipes are pretty utilitarian. However, I had fun creating this recipe, as it’s a little more “gourmet” than my usual soaping adventures. 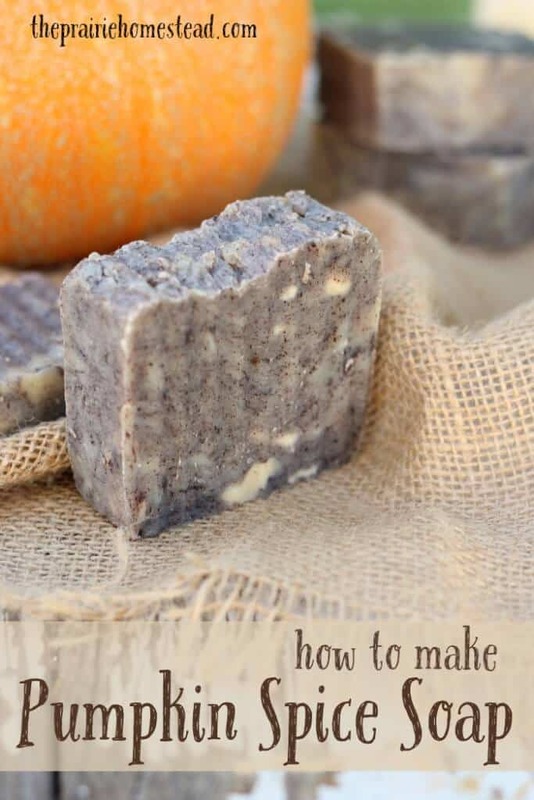 This pumpkin soap recipe uses the hot process method (aka crockpot soap). 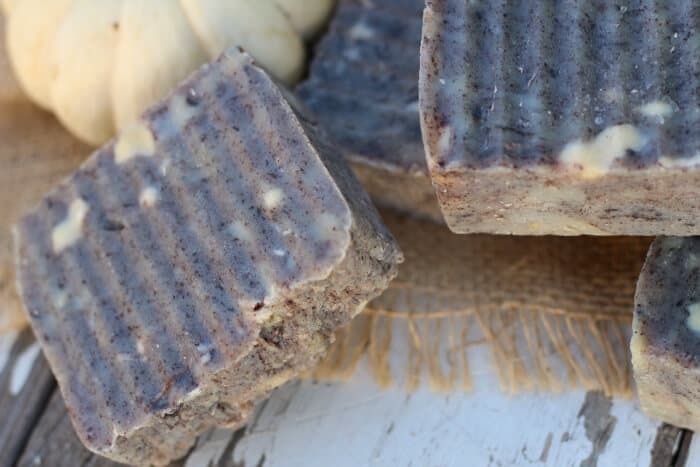 I used a very simple combination of fats to create a basic bar soap. 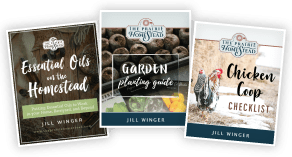 “Real” soapers often use a wider variety of oils in their recipes, but I prefer to keep my ingredients simple and easy to source. 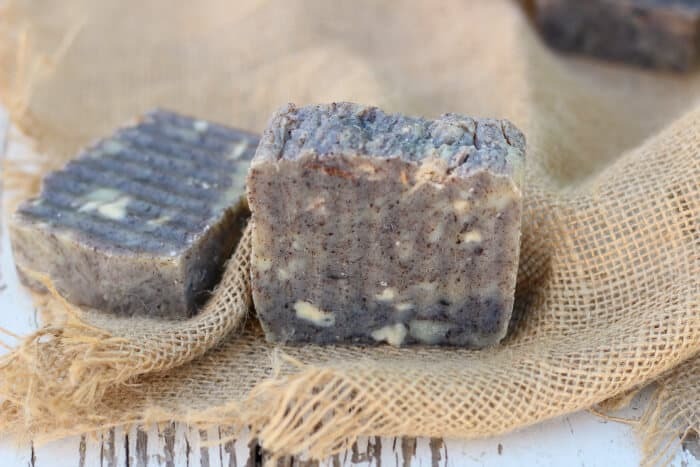 If you’ve never made soap, please first read through my How to Make Hot Process Soap post for all the details, safety advice, and equipment recommendations. Always measure soap ingredients by weight, not by volume. **If you change any of the ingredients at all, please run the recipe through this soap calculator to ensure you still have a safe ratio of oils to lye. Weight out all of your ingredients using a kitchen scale (I have this one– it’s affordable and works great). When you are making soap, you must go by weight, not by volume. When you go to measure out the lye, be sure you are wearing your gloves and safety glasses. Turn on the crockpot, and place the olive oil and coconut oil inside. Allow the coconut oil to melt completely. 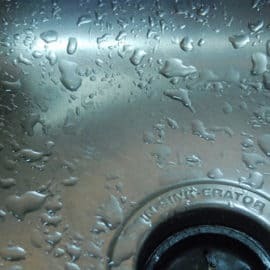 In a well ventilated area (I usually do this on the top of my stove with the fan running), with your safety gear on, carefully stir the lye into the water. Do NOT reverse this and pour the water into the lye, as this can result in a bit of a chemical reaction. 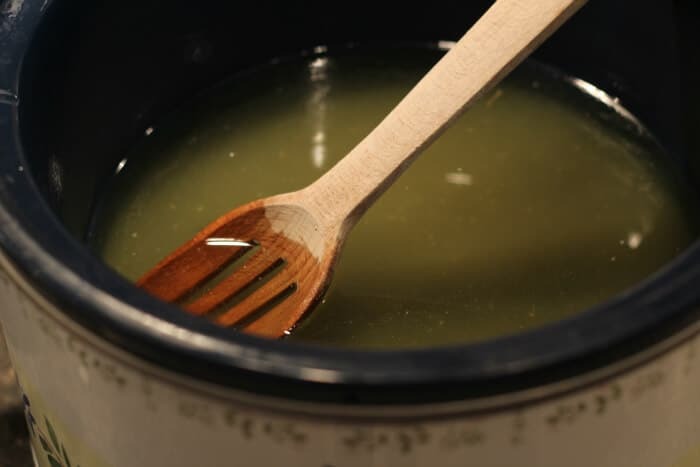 As you stir the lye into the water, the mixture will heat up rapidly, so don’t grab the container with bare hands. Let the lye/water mixture sit for 5-10 minutes. Proceed to blend the soap mixture until it starts to thicken. It usually takes 2-4 minutes. We are looking for the mixture to become more opaque and develop a pudding-like consistency. This is called “trace”. When the mixture has achieved “light trace” (i.e. 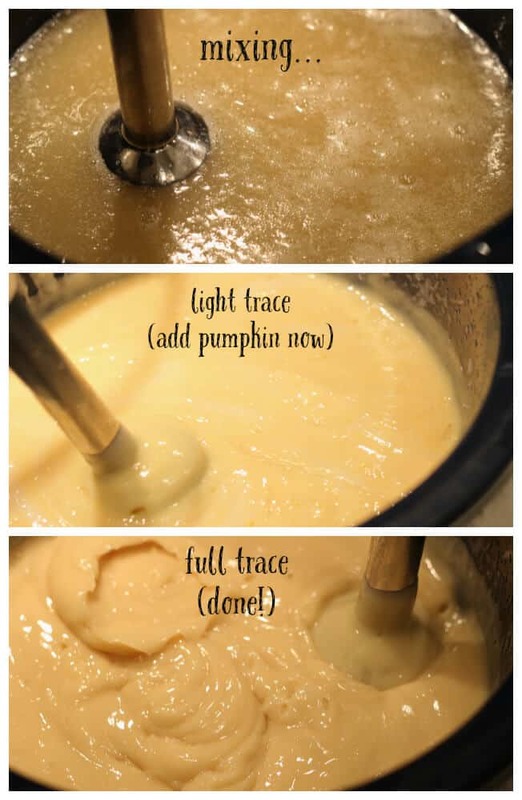 it’s thickened and smooth, but not quite holding its shape yet), mix in the pumpkin puree. Continue blending until you’ve achieved full trace. You’ll know you’ve reached this point when you can drip the mixture on top of itself and it holds its shape. Place the lid on the slow cooker and allow it to “cook” on LOW for 45-60 minutes. It will go through various stages of bubbling, rising, and frothing. I usually stay close as it cooks, just in case it wants to boil over the top. If you see this start to happen, simply stir it back down. After 45-60 minutes, perform the ‘zap’ test to make sure all the lye is reaction. You can do this by pulling a tiny bit of the soap out of the crock, allowing it to cool for a minute, and then touching it to your tongue. If it “zaps” you, you know it needs more cooking time. If it just takes soapy and bitter, you’re good to go! Remove the crock from the heat and stir in the spices and essential oils (if you’re using them). (I swirled my spices in only partially, as I wanted some variations in my bars.) The soap will want to start setting up, so work quickly. Spoon the mixture into a mold, and set aside for around 24 hours to allow it to harden completely. 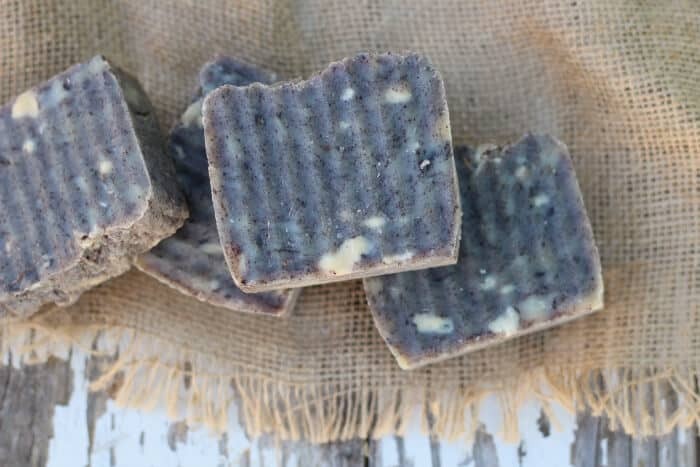 Now comes my favorite part– unmold the soap, and cut it into bars. You can technically use the soap immediately, but you’ll have a harder, longer-lasting bar if you allow it to cure or air-dry for 1-2 weeks. If you’re running low, here’s how to make pumpkin pie spice. Hot process soap generally isn’t as smooth looking as cold process soap, but that doesn’t bother me. I kinda like the rustic appearance. The pumpkin pie spice blend adds a bit of exfoliation action to the bar. If you really don’t like exfoliating soap, you can omit the spice blend. However, your soap won’t smell very pumpkin-y. This soap recipe is 6% superfat. This means there is extra fat added to the recipe to ensure all the lye is completely used up in the chemical reaction and there is no unreacted lye leftover (which could cause the soap to burn you). Make sure you’re using PURE pumpkin puree, not the “pumpkin pie filling” that comes with sweetener and other ingredients already mixed with it. Here’s how I make pumpkin puree from my homegrown pumpkins. I used this cool crinkle cutter to cut my bars, but a regular knife will work just fine too. I’m getting a ton of questions about the mold I use. This is the one I got off Amazon. It’s a little floppier than I would like, but works fine if you prop something up against the sides. About Essential Oils in Homemade Soap: I get asked a LOT if essential oils make good soap additives, and my answer is usually “NO”. 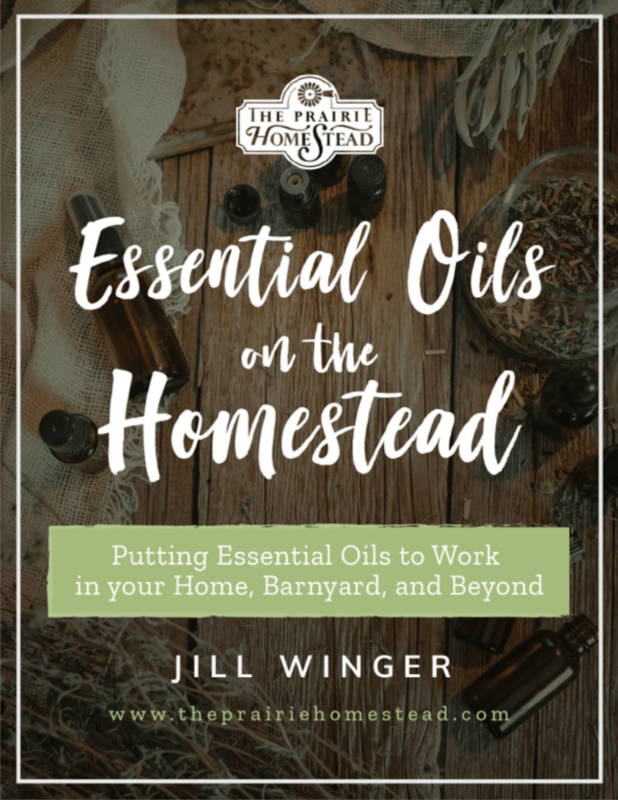 That might come as a surprise to you, considering how much I use and love essential oils in my home, but I’ve found time and time again that it’s just not cost effective to use my pure high-quality essential oils in my homemade soap ventures. It takes SO MUCH essential oil to scent a batch of soap, the final cost of the batch ends up being ridiculous. 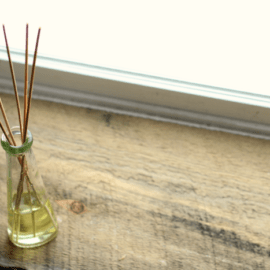 So yes, sometimes I do end up adding 20-30 drops of my favorite oil to certain recipes, but the scent usually doesn’t last very long and continues to fade over time. If you want super-smelly soap, you’re better off to purchase “fragrances” designed for soap making. I prefer not to use these in my homemade soap, so I opt for unscented bars OR I use other scent-producing ingredients like the spices in this pumpkin soap recipe. Your HP pumpkin soap looks awesome! I did a CP swirl Pumpkin Spice this year with real pumpkin puree and spices, and cinnamon essential oil. It smells divine! My kids love it, as do all of my guests (and customers 😉 ). I’m sure people are on pumpkin spice over-laod, but it’s definitely one of my FAVORITE smells and I look forward to it every year! Enjoy your yummy pumpkin soap! Thanks for the recipe! I love making HP soap…I’m almost out, so I will be trying this one! We have a ton of goats milk, can I substitute goats milk for the water ? I LOVE anything pumpkin so this makes my day! ? You can substitute goat’s milk for water. That is how I make my soap. It will probably give tge soap a different color. I’ve never made a batch using food so not sure how that would turn out. Yes– you can definitely use goat’s milk. You’ll just want to make sure it’s super cold (almost icy) before adding the lye to it. You can even start with frozen goats milk. The lye will melt it and because it starts so cold, it won’t get too hot. Can the stick blender still be used for other cooking or does it need to be a designated one for soap making? It really needs to just be for soap, there’s always some little nook or cranny that could be holding caustic lye. It may seem silly, but you really don’t want to lace your food with lye! I have found some on amazon really cheap ($12-14) or check yard sales/Goodwill for a deal. I’ve seen people do it both ways. I just have one stick blender, but am very careful to wash it thoroughly, and run it through the dishwasher, after using it for soap. It’s actually brown– that is caused by the spices that are mixed in. About how many bars does it make? You mention poring into a mold. Just curious on what I might use. I am all for Rustic.. This would be my first time a making soap. I am so excited. Thank you for the recipe. Pumpkin is VERY nourishing for the skin and hair. I use a 30 oz mold. So you could pretty much use anything equivalent to that. The number of bars it makes depends on the mold and how thick you cut them. I think I got around 10 bars, but I cut them thick. Could you please tell me the type of mold you use. 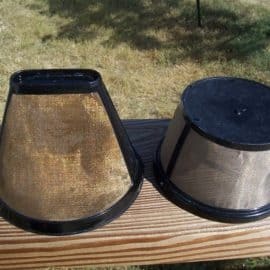 Can the same mold be used for hot and cold methods? This is the mold I got from Amazon: http://amzn.to/1jBnWIv You can use it for hot or cold process. We’ve only made soap a couple of times and have always used the cold method. Can this same recipe be used for the same? (we don’t have a designated crockpot to use for hot). Yes– you should be able to use this same recipe for cold process as well. Does it matter what kind of olive oil you use? Would extra virgin smell too olive-y? About how much does this batch makw? For a 4oz bar. I just came across this recipe it looks like from last year and I would love to make it. I am having trouble though with the measurement conversions. I can’t find pumpkin puree anywhere on the Lye Calculator, and so I am not sure how to calculate it in? I use a 5 lb mold, and I usually shoot for 84-86 Oz. I use a 30, 30, 30 for Olive, Coconut, and Palm Oils. So I would love to keep my recipe and just adjust using the Pumpkin but I am not sure how the Puree fits into the hardening? Can you help??? So How do I adjust for the Pumpkin? Thank you so much, I look forward to hearing from you! You won’t find pumpkin puree on the lye calculator—it’s meant only for oils since that is what the lye needs to saponify. Water is simply the vehicle to get the lye into liquid form to add to the liquid oils. You need to adjust your water content for the pumpkin puree since there’s liquid in the puree. So if you use 18.84 oz. of water in your regular recipe, you would decrease it by 3 oz. to account for the addition of 3 oz. of pumpkin puree. Your oil amounts would stay the same. If you use the cold process method, keep an eye on the soap once it’s in the mold going through gel phase as the natural sugars in the pumpkin could make it overheat. You may want to stick in the fridge or freezer to prevent gel phase. If you do hot process, you won’t have to worry about that. Hope that helped. I made this soap last night. The instructions were great and I love the fragrance. However, my soap did turn out greenish. Maybe I will call it Wizard of Oz soap! Before last night I had made soap two other times. My initial time was a hot-process attempt and I made a peppermint soap. It was straight forward, very easy, but the color turned out weird. The second time I made soap my roomy and I did a hot-process batch and a cold-process batch to compare the two. While I loooove the appearance of cold process- I’m too impatient. 😀 This was the third time I tried soap making and I’m in LOVE! This is amazing. I made one batch and will be making another tomorrow to sell at work. So awesome. Thank you for such great instructions and such an awesome recipe. The soap really does turn out very beautiful. Thanks again!! Hooray!! 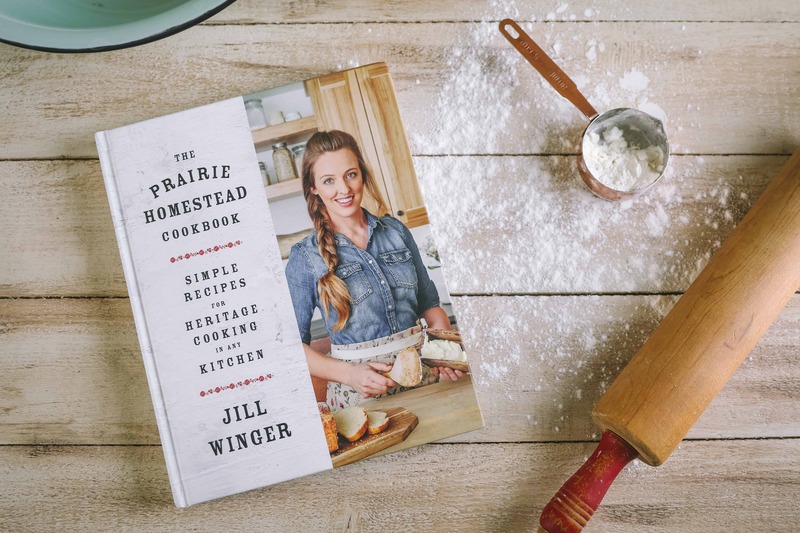 So happy you liked the recipe! This is my first review. I made this soap a couple of weeks ago. I absolutely love it. Ive made several soaps before the plain lard and lye soap. No scent whatever I did it smelled like I washed myself with a pig. Tried another recipe for mocha coffee, it kept leaving brown streaks in my shower where the water was hitting the soap. Stained the wash cloths. This soap however I cannot say enough about it. It is going in my favorite recipes homestead binder. I did add thieves essential oil in it because I was missing one. This still smells like a pumpkin pie when I get out of the shower. I love the texture it feels almost like a sugar scrub. The bad part is im using more soap because it feels so good. Thank you so much for this recipe. I am sure I will be trying more of your recipes soon. I LOVE this soap! This is my third time to make hot process soap and it turned out perfect. I did not add any of the essential oils but kept everything else the same. I cooked it exactly one hour, the pH was around 8,and it was easy to put in my silicon loaf mold. It had hardened in just a few hours (thanks to the coconut oil) so the kids and I were able to cut it the same day rather than having to wait 24 hours. In fact, it was already difficult to cut in 6 hours as it was so firm! This soap works perfectly already with no aging, suds well, and the smell is heavenly (just like fresh baked pumpkin bread). In fact, it leaves a slight residual smell on your hands for some time! I know we are a little late this season, but everyone is getting some of this wonderful soap for Christmas!!! Thank you so much for sharing your recipe! I hope you post some more flavored ones like this. A simple mix of affordable oils, but smells and looks gorgeous thanks to all natural ingredients I already have in my kitchen. ??? I am going to blog about this soap and link this post. 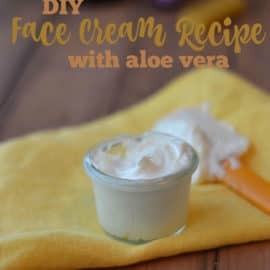 This recipe is a must for sharing!!! We are making this soap today, but I don’t think my oils will be here in time. If I follow the recipe minus the essential oils, will it be okay? Do I need to adjust the amount of Lye? Hello it seems to be a great recipe. Ive never used food in my soap, the pumpkin worries me, wont it spoil or mold? If not Im definitely making some. I always make goat milk soap and it has never spoiled, so if this doesnt spoil, why doesnt? I have never make soap before but want to try. My question is does the coconut oil need to be fractionated or does the cooking process take care of that? I borrowed a book (Smart Soapmaking, by Anne L Watson) that uses the cold process technique, and it says that the coconut oil needs to be fractionated. Hi, I Love this recipe! I made this with my mom about a year ago. I decided to use this ago, not only wroth b the pumpkin, but I’m doing one batch with applesauce and cinnamon. It smells great, I can’t wait to use it! Thanks for the recipe!! Can I use the tallow recipe with the pumpkin ingredients? Is there any other conversions that need to be made? How would that be done? I am wondering what the yellow/white chunks are in your soap? I am new to hot process and made a bath last week that also had the spots. Are they lye chunks? I believe it’s just that the spices didn’t mix in completely. It’s not lye. Add your ha ha ha to my HA! I clicked on this, thought it was for Pumpkin SOUP… which I love. Now to the roasting seeds….. Thanks Jill. Oh dear– just a slight flavor difference there, ha! I tried this recipe last night. My first crack at HP soap. It was a disaster! When I added the pumpkin purée, my batter riced and separated. I ended up with a block of crumbly oatmeal-looking Soap. What did I do wrong!? I’m new to soap making and still have a lot to learn, so forgive me if this is a silly question. Why does this still need to be cooked after it’s brought to trace via cold process? Is it because of the pumpkin purée? Hi Megan, this is actually a hot process soap recipe– the heating just helps shorten the curing time. I have made this recipe at least 4 times. Always turns out exactly how it should. I tried it without the added spices this last time. (I’m donating some bars to a Christmas care package for refugees. I wanted the soap to be special, unlike anything in the store, but not so unusual that they would be afraid to use it.) What a lovely rich golden color! I used fresh-cooked pumpkin purée from my home-grown pumpkins. The finished block weighed about 42 oz. I cut it into 13 bars weighing about 3-3.25 oz. with a crinkle cutter. As I used cassia and clove essential oils, it still smells like pumpkin bread fresh from the oven! When I do use the spices, I only use about 2 Tbl and I think it’s the perfect amount of exfoliation.